SOLID TURN OF THE CENTURY HOME MINUTES FROM HOWELL/FOWLERVILLE/BRIGHTON AND ALL CONVENIENCES. LESS THAN 15 MINUTES TO I96- YET COUNTRY LIVING WITH A MOST IDYLIC SETTING. FIRST TIME OFFERED IN OVER 1/2 A CENTURY THIS FAMILY OWNED FARM HAS BEEN METICULOUSLY MAINTAINED .THE HOME HAS ALL THE CHARM OF YESTERYEAR WITH ORIGINAL STAIRCASE, TRIM, CABINETRY AND WOOD FLOORING, YET UP TO DATE ARE ALL THE MECHANICALS! ELECTRICAL, PLUMBING, ROOF, WINDOWS,HOT WATER TANK HAVE ALL BEEN REPLACED MEETING TODAYS STANDARDS! NUMEROUS OUTBUILDINGS FOR HORSES, CATTLE, SHEEP EVEN ITS OWN CHICKEN COOP ARE IN EXCELLENT CONDITION. FARM IS READY FOR A NEW FAMILY TO CARRY ON THE TRADITION. 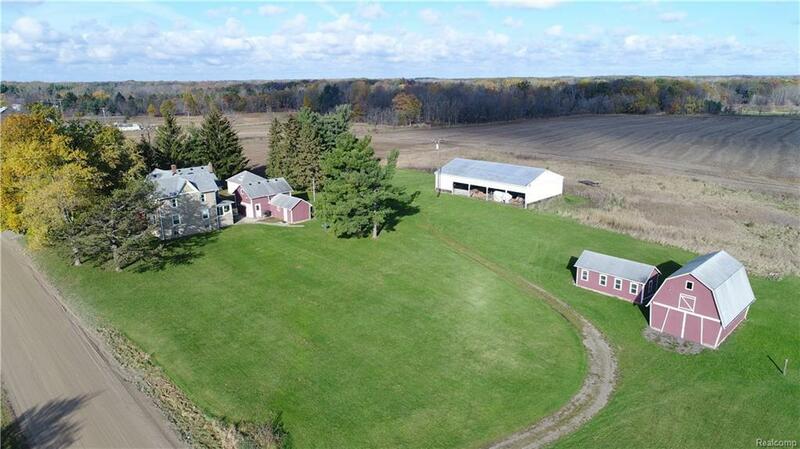 TILLABLE ACREAGE AND/OR PERFECT FOR PASTURES. SOME WOODS, EXCELLENT HUNTING. 40 ACRE OR AN 80 ACRE. SEE ML#217061688 CURRENTLY 1.1 BATH SELLER WILL AND FULL BATH UPSTAIRS PRIOR TO CLOSING.